or: Selling the American Dream. One word to sum it up: Indulgent. If anything, I came out of this movie wanting their job. Well, the whole secret thing probably wouldn't be ideal for me, and I don't know whether I'd just give myself up to a family of strangers, but I certainly was envious of the things they got paid to have. Looks like a good life. Even if it is a bit of a selfish one. This film has such a great premise, which totally fits to what's happening in the world: more often than not we will buy something if we have seen it with someone else. 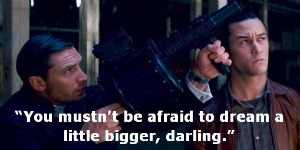 The Joneses takes that idea and puts it into overdrive. I still felt persuaded to go and buy something flash after watching this family. So, I'm guessing that people who have a bad spending history should probably avoid this film, because if you're easily persuaded it will end up costing you money. 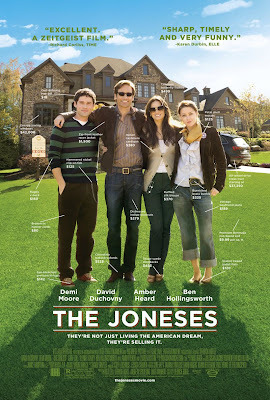 One of the downfalls of The Joneses, however, is the fact that it's premise isn't explored as well as it should be. The two lead characters, Steve and Kate, are explored perfectly through their romance which takes front row in this film. It's no surprise that that would take over, Hollywood being Hollywood, but it's more interesting watching the neighbourhood's reaction to this new family. Jenn and Mick, the children, aren't that well explored. They were very flat characters which had a few dimensions which stuck out at times, but their background is never fully looked at. I would have liked to have known a bit more about the characters before they became the Joneses. That interested me a bit more. In saying that, this was still a very good film. It boasts some wonderful performances. I mean, who knew that Demi Moore could still act instead of tweet all day? And how does she still look so amazing? David Duchnovy does a good job in the very lead role, anchoring the film with his charming and often clueless persona. Amber Heard has always been an actress who has confused me. She is kinda shaping up to be the next Megan Fox with films like Drive Angry, but I don't think she'll ever stoop to that level since her turn in this was surprisingly good. If only her character was a little bit more, she could have really bloomed. The rest of the film, however, blooms, and makes for a great timely film with an interesting look into suburban life and all the secrets that come with it. THE VERDICT: Though it doesn't stretch the film to it's limits, The Joneses is an interesting and funny look into the lives of others. I haven't even heard about this film. It looks like it's a nice watch with the family. It's pretty alright...it really surprised me, to be perfectly honest! (A year and months later...) I found it to be a powerful entry into consumerism. While tupperware parties and door-to-door sales have collapsed under Amazon's weight, the power of face-to-face demo's still is critical to the Gotta-Have-mania. The schmaltzy ending is my nitpicking complaint.